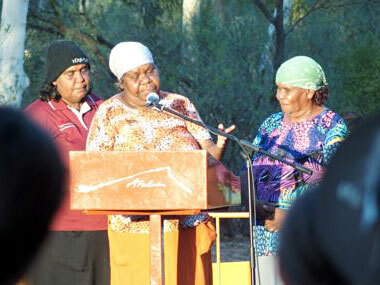 Rabuntja's Opening is Marlene Rubuntja, winner of the Vincent Lingiari Art Award this year, opening the Desert Mob exhibition, flanked by other Yarrenyty Arltere Artists Dulcie Sharpe (Left) Dulcie Raggett (Right). Why have I never been before??? I've experienced both the NATSIAAs/Telstras in Darwin frequently and CIAF in Cairns occasionally – both important gatherings of the Indigenous art clans, where new art is seen and sold, where remote art centres have brief moments in the urban sun, and where conversations are had that reveal some of the hopes, fears and achievements of this at times uncertain art movement which may (or may not) have been hailed by the late Robert Hughes as “The last great art movement of the 20th Century”. Well, the now 26 year old Desert Mob in Alice Springs has all that in spades! Yes, it's restricted (like CIAF) to its own region, which stretches many corrugated and sandy kilometres from Borroloola in the northeast to the Spinifex mob down at Ilkurlka, West Australia. But that includes 31 art centres who turned up in Alice to show the art that they thought currently most important in the main Araluen Art Gallery show, then to set up market stalls for a frenetic morning of trading in art costing less than $500 and a chance to talk directly with buyers, and for the select few, there was then the opportunity to really open themselves up to an engaged audience through the day-long Desert Mob Symposium. And all this may take on even greater importance as a consequence of the recent NT election, which returned Labor so comprehensively to power. For, not only does Mark Crees, director of the hosting Araluen Cultural Precinct refer enthusiastically to the “sustained investment by the NT Government in the art, artists and remote art centres of Central Australia” in his catalogue introduction, but NT Labor has made election commitments to spend $70m on an 'Iconic National Indigenous Art Gallery' and an 'Iconic National Indigenous Cultural Centre', both in Alice Springs. I look forward to finding out the precise differences between the two – but have long argued for a national Indigenous cultural institution, which would tackle some of the cultural complexities of traditional Aboriginal and Torres Strait Islander belief systems so that people could go on to read just a little bit more into the art, and lose some of their uncertainties when faced by it. And I'm delighted to note that NT Labor has already appointed an Assistant Minister, Chansey Paech, with specific responsibility for these election promises. And why not in Alice Springs, even though I'd envisaged my institution in Sydney??? The town has a troubled reputation; but I walked, cycled and drove around the town over 3 days and nights without a hint of a problem. And surely a boost to visitor numbers and town income as a result of establishing it as the home of Aboriginal art and culture in the country can only add to that sense of self-worth. Another thing I've long argued is needed in Alice is a painting centre for visiting remote artists where they can avoid exploitation by passing carpet-baggers and their own families. Desart, organiser of the Desert Mob events and the over-arching body for all the art centres has been remiss in failing to establish this in conjunction with them. But it did apparently recognise this and come up with a temporary solution last Christmas, according to Desart CEO, Philip Watkins. Twenty artists took advantage, setting their own rules for access to their temporary studio. Sadly, it looks unlikely to be repeated this Christmas. And a rumour going around Desert Mob (it's a hotbed for that sort of thing) was that the very divisive private dealer Chris Simon, who runs a successful painting 'property' just outside town where many senior artists have found refuge and painted brilliantly, had offered the place to Desart, only to be turned down. NT Government funding for that would be a better spend than a new art gallery, I venture to suggest. And if you think I'm being excessively political about art, let me assure you that the Desert Mob symposium – such a rare opportunity to access the ideas flourishing in such remote communities - revealed quite as much politics amongst the artists! Perhaps that was inevitable in an event that was consciously celebrating the 50 years since the Wave Hill Station walk-off with the somewhat underwhelming debut of the Vincent Lingiari Art Award, and the 40th anniversary of the Aboriginal Land Rights (NT) legislation. It's almost 70 years since Albert Namatjira died and the NT Government handed his copyright over to commercial interests. But they haven't forgotten or forgiven at the Iltja Ntjarra Many Hands Art Centre where many of his descendants still reverentially paint landscapes in Albert's watercolours. Is this just habit? For, given both a residency by urban firebrand Tony Albert (no relation!) and the opportunity to present at the Symposium, the Namatjira clan seemed happy to add spine to their gentle works with the surtitling of phrases such as 'Copyright for Namatjira' and '20 Year Wait', referring to their failure to benefit from Land Rights with anything as tangible as homes on their land. They also painted images of mining equipment despoiling that land and cola cans sugaring their kidneys. But, interestingly, in Alice they didn't show works in the series that Tony Albert is currently offering for sale in Sydney despoiling their landscapes with his trademark ashtrays and ugly cigarette butts. The history of the Purple House is also a political one. For, one reason so many remote artists need to be in Alice relates to their own or relatives' reliance on dialysis. All the way down the line, authorities have insisted that this is the only place that they can supply relief for the epidemic of kidney failure sweeping Aboriginal Australia. Even when the famous 2000 Western Desert Dialysis fundraising art auction brought in a million dollars, NT health authorities insisted that a dialysis unit at Kintore wouldn't actually work. Now, as the delightful Sarah Brown told us, “after 10 years plus of 6 days a week work, you can die on Country with a bellyful of lizard!”. Twenty-four dialysis machines operate in 11 remote places and the Purple Truck moves around to fill the gaps. Still, as they try to expand out of the NT, the South Australian government says it's too broke to fund a machine for Ernabella community, home to our first art centre. Obviously, small, impoverished and incredibly remote communities are prepared to take action for themselves when fired up. And they'll buy in help to achieve it. Iwantja Art Centre at Indulkana received pride-of-place as the last presentation in the Symposium for its hilarious manipulation of Vincent Namatjira's idiosyncratic artworks on film. 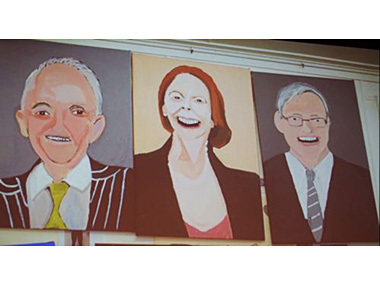 The figures in his 'Prime Ministers' series of portraits were all given their own voices and mouth movements, all reverting to “Blahhhhhhhhs” as their speeches were received by their distant constituents. OK – so one Jackson Lee was credited with the film work. But, as the Desert Mob main show revealed, Vincent Namatjira makes such paintings in the first place; and around him at Iwantja are innovators in their own individual ways such as Tiger Yaltangi, Peter Mungkuri, Kaylene Whiskey, David Frank and the exquisite night sky painter, Vicki Cullinan. It's clearly a ferment. And so is the youth scene at distant Warburton. In the face of record suicide levels amongst young people, the Ngaanyatjarra mob called in outside guns six years ago to set up Wilurarra Creative for 18 to 30-year-olds. And the filmed record on stage, backed up by their 'Alanya', self-designed magazine suggests that getting kids 'lookin' good' is half-way to giving them self-worth as well. Clothes, make-up, hairdressing all contribute – with 90 participants involved in designing and making such props as well as being photographed in them. Community adverts have flowed from the exercise and muso Grenville Westlake Porter reckons, “Young people are looking after this place now”. Another of the nine Symposium presentations was of fashion from eight art centres and the Territory's Batchelor Institute, showing just how important material art is becoming in this post-GFC slump. But what of the art, you ask? Well, demand at Desert Mob was outrageous, with works up to $18,000 flying figuratively off the walls, as might be expected, I suppose when queuing started 4 hours before the opening. My artist picks, in no particular order were the Spinifex mob collaboratively, Angkaliya Curtis, Yaritji Young, Tilau Nangala, Vicki Cullinan, Gloria Panaka and Rachael Mipantjiti Lionel – nowhere more than one 'star' per art centre apart from the Spinifex. Of course, this is just my taste – which extended to a sense that Warlukurlangu Artists, the Artists of Ampilatwatja, and, of course, Iwantja, have a communal level of quality which suggests things are pretty 'Palya' at all three. Elsewhere in the 220+ work show, I have to say I observed a familiarity which blinkered my gaze. But then, I see a lot of Aboriginal art. So I'm not quite sure I can agree with Marlene Rabuntja, winner of the inaugural Vincent Lingiari Award that ”Side by side, our work is more stronger”. But there's undoubted truth in her revision of that, “How beautiful it is when we all come together”. Talking of coming together, the old Art.Trade dealers' association relaunched as the Aboriginal Art Association of Australia, reaching out to art centres and institutions to join them and adopting much of the Indigenous Art Code's (IartC) ethics as their own, even suggesting that they'd like it to be mandatory. While attendance at the launch went from the National Museum via the IartC to one or two art centres, I suspect the real trick will be to educate the public about ethical and quality buying, as the IartC has so far failed to do. Meanwhile, many of the riches of Desert Mob will still be around between 23 September and 2 October when the inaugural Parrtjima Festival in Light will brighten the Centralian nights with art out at the Alice Desert Park. More on that later. Vincent's PMs - cartoon versions of Vincent Namatjira's portraits of Prime Ministers as part of Iwantja Art Centre's brilliant filmed presentation in the Symposium. 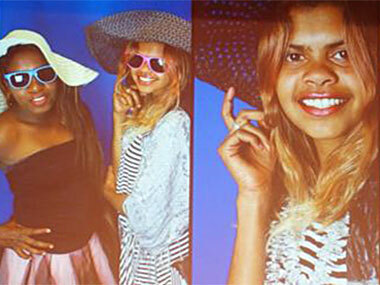 Wilurrara Creative's fashion statement showing the potential of youth in Warburton delighted the Desert Mob Symposium.